I can't believe how fast Christmas is approaching. I swear it was just Halloween and Thanksgiving not so long ago. I absolutely love this time of the year. I am extremely grateful for my life, but during this time of the year I seem to really reflect on how blessed I am. I have a loving husband, my adorable pups that love me unconditionally, a very rewarding job, a supportive family, and friends that are like family. As for material things, I don't need anything this year, but there are a few things that I would want. 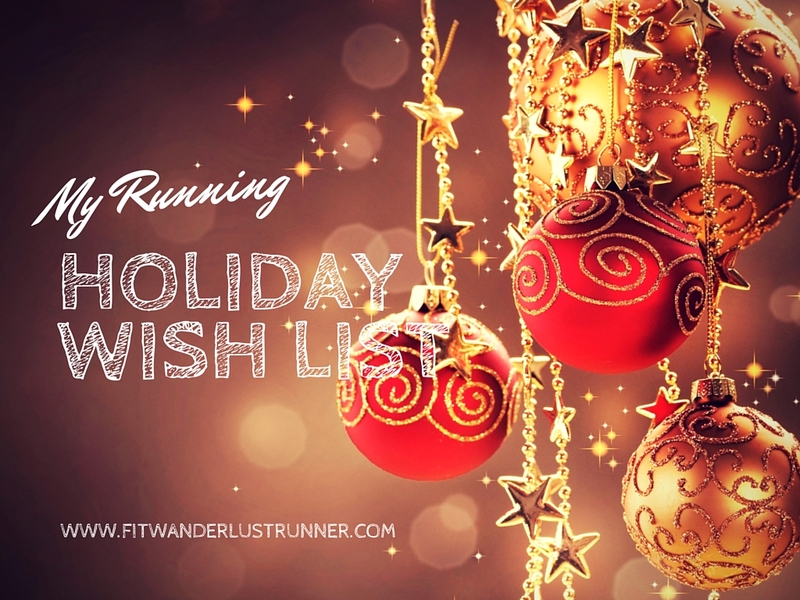 So if you feel like being in a giving mode here is my running wish list. Let me know if you need my address so you can mail me one of these items :) j/k. Selfie Stick for Go Pro : My wonderful husband got me a GoPro for Christmas this year (I know he is awesome!) so now I would love a selfie stick for my camera. I found this one that is actually compatible with phones and other cameras. We are heading to Cancun in a few months, so I can't wait to test it out there. Brooks Women'S Glycerin13 : I always want running shoes! The last few years I have really loved my Brooks running shoes. They provide enough support and they fit like a glove. I have been good lately and haven't purchased a new pair since my birthday in September. But I have noticed the tread on my shoes is fading away which can only mean one thing: time for new shoes!! Garmin Forerunner 235 - Frost Blue : I have said it before and I will say it again...buying my Garmin has been one of the best investments I made for my running. I have been using the same Garmin for many years but I feel it may be time for an upgrade. This new specific model has so many cool features but the two things I absolutely love is the wrist heart rate monitor and it has smart notifications (emails, texts, etc.) I love how I could not only wear this watch for running but day to day too. Yurbuds Headphones (Aqua) : I go through headphones like crazy! I always get Yurbuds because they fit the best in my ears. I have a really old pair right now that is on its last leg. I always listen to music or podcasts when I run, so this these headphones are essential. Under Armour Women's Long Shorts : I can't run in normal running shorts due to my chub rub. I have tried everything to prevent it, but I have pretty much given up. That is until I read about these UA shorts. I am really hoping all the reviews are correct and I can finally run in shorts again! Since in San Diego winter is pretty much non-existent (sorry East Coast friends! ), I can wear these year round. out those new high tech ones out. :) I used to be the same way, that is partly why I haven't upgraded. I am super excited to start using my GoPro! Don't have a Garmin, smart phone, Go-pro, ear-buds, etc. I have shoes/shorts/running bra. And I sometimes carry a water bottle. That's all I've ever needed- going on 45 years of running. Good for you! I just need music to listen to when I run. I can go without my watch but I like knowing my pace. Aren't Brooks shoes just amazing? I love them! Thanks to the author for providing valuable information about the Brooks Women's Glycerin 13 shoes. One of my friends who have recently taken to running was asking me for a good pair of running shoes and I can recommend her these shoes. Moreover, one of the most important things to remember while running is that the shoes must fit perfectly and the sole must be spongy enough to absorb the impact of the hard surface and must also have good grip. This will help you in avoiding the common injuries associated with long distance running.